Join the discussion on our forums! Come discuss Daring Fire-Eater over in our dedicated Daring Fire-Eater discussion topic. Will be a staple if Ping Mage works out. Already theorycrafting a few decks. Thoughts? 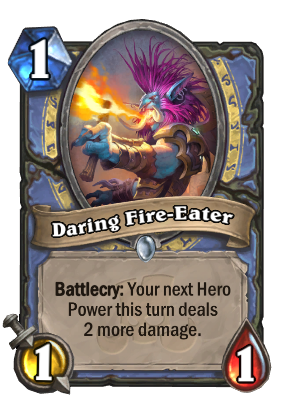 I am pretty excited to try Odd Hero Power centered mage now and hoping for it not be overhyped. 3 Mana Deal 3 damage summon a 1/1 on average. No synergy with spell damage, won't see play. in Odd mage this is a 3-mana JAde LIghtning. In regular mage it can be a 5-mana "hellfire" with the dragonhawk spirit. I mean, Cosmic Anomaly + Shooting Star saw play as well and this is pretty much the same combo with bigger payoff in the long run.